There were two grand and epic films in English his year, Malick's and Von Trier's, which seemed to present warring world views at Cannes. Von Trier's isn't really American but since there were not quite enough American films for a list of ten best, and it goes so well with Tree of Life and has American actors in it I put it in that list, which replaces my usual "Best in English" lists. It's also kind of fun to list Lars, who won't set foot on American soil, as an American. There don't seem to be as many good foreign US releases. (This is partly because I prefer not to list films I listed in previous years even if they got a US release in 2011.) But there were a few fine new ones. The Dardennes' Kid with the Bike tells an abandoned boy's story with overwhelming moral authority and simple emotional force; not unusual for them but inconceivable for almost anybody else. Submarine is exceptionally witty and articulate. Tyrannosaur is a work of searing grim power. Weekend is a surprisingly vivid and honest little film of a few intense days between two gay men who've just met. Like L'Exercise de L'Etat but for different reasons, the theater was packed when I watched it, to electric effect. Audiences matter, and the shared experience in the dark still means something special. The degernation of the blockbuster cineplex experience with its chattering commentary (like lip readers, unable to watch without mouthing comments) and texting and rattling popcorn bags goes with the degeneration of the blockbuster film; of the larger commercial movie industry product. I listed a few good ones though. But I don't see the point of including them with films that were made for other reasons than to make money. There were some strong new American indie films this year, including the very pure and kind-hearted Terri, the alive and fresh Pariah, and the triumph of bad boy gadgetry, Bellflower. Of course Take Shelter is an indie film in some sense too, but on a different level, with actors emerging as major, Jessica Chastain and Michael Shannon, and a perfectly constructed screenplay by the director, Jeff Nichols, which you don't get very often in any film. It's interesting to see a writer-director emerge into the first rank. That happened also with the Mexican, Gerardo Naranjo, whose use of long takes in Miss Bala is remarkable and underlines its claustrophobic intensity. Other directors made strong comebacks. Wes Anderson's belated return is a big-heated, grown-up tale about a man child playing father. It's a pleasure to herald a movie by Woody Allen that is both accomplished and kind hearted (despite the dislikeable fiancee and her materialistic parents). Margaret is a real indie film too: so much so that almost nobody got to see it, even after the six-year delay over editing. It's truly independent because it won't fit any mold and it emerges as rough, over-the-top, and exceptionally rich, novelistic, and exciting to watch. Brad Pitt astonished this year, not only appearing in two of the best movies, but delivering fine and wholly different performances in each of them. His wife also impressed: though her harrowing Bosnia film in the BHS language with subtitles In the Land of Blood and Honey isn't an unqualified success in the writing department, it's serious and accomplished and very well directed. So much for the prejudices against "Brangelina." In the case of the documentaries one could list many more than ten. As long as a non-fiction film provides useful information it may be worth watching. But those that are real works of art are few and far between, and would include Nostalgia for the Light and The Tiniest Place, both Latin American; and the unreleased English film The Arbor and the limited release The Mill and the Cross. Those two both incorporate acted elements and special visuals. The unique Werner Herzog's documentaries are quite naturally in a class by themselves. His new one about executions in Texas is enriched by his exceptional commitment and moral sincerity; his rapport with his interviewees is also impressive. I was not impressed by his cave paintings film in 3D (which except in the new Harold and Kumar film seemed pointless this year, as before). As usual a lot of stuff impressed the critics that contained at least one terrible flaw: I put major examples of this in my "Overrated" list. The marketplace and the downgrading of the culture mean that there are many heralded new films that seem pointless to me. There was a terrific range of unreleased foreign films, everything from the simplicity of first love in Un amour de jeunesse (Mia Hansen-Love) to coming of age in time of war (Black Bread) to the woes of being a government minister (L'Exercise de L'Etat) to a corporate thriller (The City Below) to a tense drama about a father and son who're Talmudic scholars! And I'm sure many more from exotic sources that I have missed. All the following lists are alphabetical except the first two, which are best first. P.s. : I had to move The Kid with a Bike from Best Foreign because it won't be released in the US till March 2012. But it's my favorite foreign film of the year. Suggestions or corrections welcomed, but don't tell me Lars isn't American. I know that :) . Last edited by Chris Knipp; 12-14-2013 at 12:53 PM. I think I've commented on all of these but the four I have not seen and can't think of anything more to say. Thanks for your reviews of so many movies in 2011, CK. I don't remember what you thought of Tuesday, After Christmas. Did you see this one or reviewed it? Happy film going in 2012, indeed! Currently attending the MIFF, then Spring Break, then the Society for Cinema conference in Boston. Thank you for following my reviews. It's good to know someone as discerning and committed as you is faithfully reading them. NYFF 2010: that's where I reviewed Tuesday, After Christmas. The main slate included seven of your current choices. And also Carlos, Of Gods and Men, Laraín's Post Mortem, the German film The Robber, The Strange Case of Angelica, and The Social Network. New Directors/New Films 2011: this included my favorite recent Romanian film, Outbound (Bogdan George Apetri 2010) and one of my favorites of the series. But it had competition because the ND/NF 2011 slate included Margin Call, Incendies, Pariah and Tyrannosaur. Black Power Mixtape also had great archival footage. Last edited by Chris Knipp; 03-04-2012 at 07:15 PM. Great. Thanks. I'd like to point out that I decided not to list Edward Yang's A BRIGHTER SUMMER DAY. It premiered in 1991 but had a theatrical run in the US last year (it also had a week's run in 2004). This would be my favorite film of 2011 if I had decided to include it. It is rumored to become a Criterion Collection release although there is no formal announcement or firm dates. This is perhaps the crowning achievement of New Taiwanese Cinema. It is not a "difficult" film by any means but apparently the 4-hour running time has limited its theatrical distribution. Let me know when this Edward Yang film becomes available on DVD because I'd certainly love to watch it. I have found a copy of it online and ordered it. I think the subtitles may be in French but that'll be okay. Great. I hope you enjoy it. Let me know what you think. I have the film in a low-resolution format that was used in Asia about 10 years ago: the VCD. Can't wait for the DVD. I went to a budget theater yesterday to see the only movie remaining that I must see before I can develop my final top 10 movie list for 2011. But twenty minutes into watching The Artist, the movie house went "silent" literally and I'm not talking about the movie. The entire city block had a power failure. I did receive a rain check. The irony is that of all the movies I had gone to see during the past three or four years, it's been the first time that I had gone to see a movie using a rain check (a rain check that I had previously received at the same movie for some problem with the advertising times about a year ago). So now I have another rain check for a movie I had went to see using a rain check. Anyway, when I do finally get to see The Artist, I will publish my top ten movie list here. I am most curious about your opinion of A DANGEROUS METHOD, the best film in the English-language I watched in 2011. If you have not seen it, the DVD is out. 1. Another Earth (2011). An amazing intimate psychological drama the weaves and reiterates a full panorama of emotional, introspective, and even existential sensations. A movie is about the tragedy wrought by a young, highly intelligent but naive girl and how she attempts to discover redemption, even as the discovery of another world almost identical to earth is announced. (Reviewed 2/17/12). 10/10. 2. Extremely Loud and Incredibly Close (2011). This compelling movie presents an truly memorable experience of death and grief as a mentally challenged boy seeks the lock to a key left behind by his father who died in 9/11. Nominated for Oscar Best Picture. [Reviewed 1/22/12]. 10/10. 3. Money Ball. (2011). Director and actor Brad Pitt has brought to the big screen an new perspective and vision of film making in the form of a baseball movie, that captures the nature of bringing baseball to the game, instead of baseball itself. With a brilliant use of raw ambiance sound technique that captures a more realistic documentary feel along with fine editing retaining the main storyline and excellent use of silence and prolonged scene transitional, Pitt has put together one of the best movies of the year. Nominated for Oscar Best Picture [Reviewed 9/26/11]. 10/10. 4. 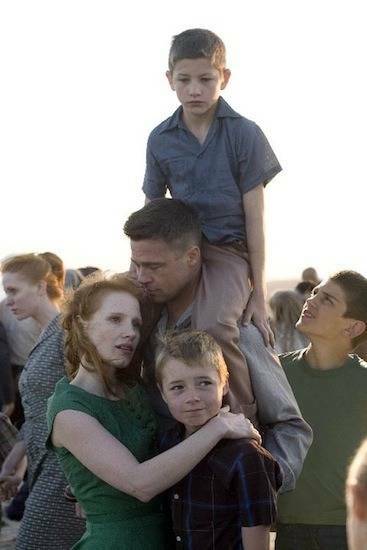 The Tree of Life (2011). A fusion of creative film techniques brings the power of emotive realism into sharp relief of memories and of family drama in the 1950s and the mystery of life and death. Nominated for Oscar Best Picture. [Reviewed 1/3/12]. 9/10. 5. The Artist (2011). A richly capture black and white emotive and vibrant silent movie that grips the audience in its tender visual and auditory experience, that revolves around the universal experiences of romance gain, lost, and gain once again. A contemporary old fairy tale. Best Picture Oscar winner. [Reviewed 4/8/12]. 9/10. 6. The Help. (2011). Like Uncle Tom(s Cabin (1852), this movie exposes the thin veneer of racial progress that America has made since the Civil Rights movement of the 60s. Viola Davis play a servant, maid, help of a white 60s family who is befriended by recently college graduate played by Emma Stone who seeks to write a book based on African American helper experiences in a small Mississippi town. The movie is power in many scenes depicting in ways Saving Private Ryan was able to depict World War II, The Help exposes the hidden racial divide of America in the South both its drama and humor in important, but belated ways. Nominated for Oscar Best Picture. [Reviewed 8/14/11]. 9/10. 7. Super 8. (2011). This family sci fi movie is ET all grown up which is both its weakness and its strength. This bigger budget and special effects version of Wavelength (1983), it takes from ET (1982), Goonies (1985), Stand by Me (1986) even The Fugitive (1993) (in its special effects) in its development. Some great physical acting, with headshots, overall while the plot is so simple, J. J. Abrams has put together a well balanced, engrossing sci fi movie. [Reviewed 6/12/11]. 9/10. 8. Hugo. (2011). A great use of 3 D adds to the rich ambiance of this historic, period movie set in the early days of cinema and whose solid storyline reveals a fascinating mystery that is uplifting with its emotive scenes of struggle and the search by a boy for the missing pieces and history behind a mechanical man. Nominated for Best Picture Oscar. [Reviewed 11/27/11]. 8/10. 9. New Year=s Eve (2011). The huge ensemble casting experience results in a difficult but successfully accomplished holiday family comedy drama feature film that delights on many different levels with different stories and uplifting emotive power. [Reviewed 12/18/11]. 9/10. 10. Melancholia (2011). Lars von Trier’s ambitious attempt to capture the vibrant reality of human beings at a lavish wedding and another planet’s trajectory threatening the earth. A visual and auditorily amazing presentation with gripping, visceral performances. However, von Trier’s monotonous musical theme and an important omission of a more complete human narrative of the three primary characters nearly derails the movie. [Reviewed 4/1/12]. 8/10. The Adjustment Bureau (2011). Matt Damon and Emily Blunt star in this intense and compelling sci fi mystery thriller about the world being inhabited by a Bureau that seemingly controls the destiny of humans. This strongly relational movie depicts the universal premise of the core of being human. With only a few early bumps in presentation, this movie is solid and qualitatively an improvement on its earlier incarnations. Just pushed out of the top ten by the rest of the top tne movies. [Reviewed 3/6/11]. 8/10. The Adventures of Tin Tin (2011). A fine animated recreation of the cartoon series into an amazing, but almost too long, magical experience of the original characters and storylines as the advances in animation have arrived at a new transformative period in film by Steven Spielberg. [Reviewed 1/1/12]. 8/10. Debt, The (2011, USA). A solid, but flawed dramatic, cerebral espionage drama that is captivating for its suspense, its mystery, its human emotive value, and twist that however isn(t used to its full potential, with an ending that seems overly convenient and an antagonist that doesn(t provide for a lingering element of mental/emotional conflict. [Reviewed 1/8/12]. 8/10. The Double (2011). Starring Richard Gere as former assassin hunter who is recruited to work with an FBI analyst to discover a Soviet assassin who apparently resurfaces and assassinates a U.S. Senator. More of a cerebral espionage thriller with a nice cat and mouse theme/presentation with a good performance by Mr. Gere and is better than most and what credit offered up and an expected twist, but exposes some weaknesses in its presentation of what the audience expects of a superlative competence of technique and also disappoints with a script that can only offer a rather predictable and unlikely ending. [Reviewed 2/4/12]. 8/10. Green Lantern (2011). Ryan Reynolds brings to life this less well known superhero in an authentic and genuine manner in this well balanced, non over the top sci fi action thriller that provides great character development, fantastic set designs, and a serious script with good emotive punch. [Reviewed 7/2/11]. 9/10. Hanna (2011). Saoirse Ronan follows up with fine performance in THE LOVELY BONES (2009) with art house version of the espionage, killer action thriller. Even with the technical weaknesses, the fusion of character development and acculturation is fascinating and compelling. Among the best reviewed, not quite making the top ten list. [Reviewed 4/10/11]. 8/10. The Killer Elite (2011). This nicely balanced, more reserved relational angle of this action thriller, contract killer mystery has a good plot with twists, a more gritty presentation. Unfortunately, the slight cerebral flaws and the omission of the more fascinating continuing interplay between the antagonists at the highest levels, keeps this movie from being a ground breaking classic. [Reviewed 9/25/11]. 8/10. Kung Fu Panda 2 (2011). There are some classy one liners and a more cerebral, substantive humor it places in this animated movie. The movie was slow a few places and didn(t seem to sizzle and intrigue as much as the original character development movie, but it retained its charm and by the end it had a solid emotive climax. Nominated for Best Oscar Animation. [Reviewed 5/27/11]. 8/10. Larry Crowne (2011). A great feel good summer romantic comedy for the over 35 with Tom Hanks and Julia Roberts who play a laid off store employee and a community college teacher. A restrained but entertaining movie that captures the relevant experiences of those over 35 in America. Only the final two minute speech seems to lack a classical punch, otherwise this movie really shines. [Reviewed 7/4/11]. 8/10. Mission Impossible: Ghost Protocol (2011). Perhaps the hottest action movie of 2011, except with a few technical weaknesses. This high wire tension packed movie with a little more humor this time around is solid, if not great. [Reviewed 12/25/11]. 8/10. Rum Diary (2011). Produced by and starring Johnny Depp as a journalist newly hired for a declining paper in Puerto Rico in 1960s, this slow, but immersive movie is a mature, slice of life about greed, sensuality, integrity, and human growth. Among the best movies of the year, barely missing out top ten. [Reviewed 10/30/11]. 8/10. Sherlock Holmes: A Game of Shadows (2011). A richly photographed action movie that uses its slow motion, color scheme, and set design to excellent use while incorporating a nice balance of action, comedy, and Sherlock Holme(s mental sophisticated to great use. [Reviewed 12/17/11]. 8/10. Season of the Witch (2011). A richly immersive and layered Medieval mystery occult horror movie with Nicholas Gage in gorgeously dense period setting that perhaps reveals too much and descends to much into the typical good versus evil by the end. [Reviewed 11/8/11]. 8/10. Source Code (2011). Jake Gyllenhall, and Michele Monaghan star in this surprisingly humanly touching sci fi mystery thriller that fuses Groundhog Day, Inception, and Cube Zero into this investigative, terror disaster action movie that doesn(t quite capture the fascinating elements of Groundhog Day. But this is an entertainment, early release of what is usually a summer entertainment movie for the masses. Almost a top ten movie. [Reviewed 4/3/11]. 8/10. The Three Musketeers (2011). An entertaining action adventure movie that misses out being a classic because of its attempt an uneasy blend historical period with fantasy elements. [Reviewed 10/31/11]. 8/10. We Bought A Zoo (2011). An entertaining family movie starring Matt Damon in a storyline stand out for this year, which except for a missing laptop photo scene and perhaps underdeveloped animal and human supporting cast is a feel good movie of the year with a nice dose of both charming humor and emotive drama. [Reviewed 12/23/11]. 8/10. Columbiana (2011). A revenge movie involving a girl seeing the death of her parents who grows up to be a contract killer and seeks to locate those responsible by a series of personal kills to bring out those responsible out into the open. Has some nice technical elements, yet also weak editing decisions and moral qualms that are introduced about the main character. [Reviewed 9/4/11]. 7/10. Contagion (2011). This rather revealing and creative look into the global infectious contagion has too many plot strands, underdeveloped characters to really provide the emotional intensity and interest the movie deserved. [Reviewed 9/17/11]. 7/10. The Descendants (2011). An overly ambitious but bold and at times emotionally striking family drama about death and infidelity, that doesn't provide sufficient character development nor plot development with uneven editing and too unnecessary many characters, and an unnecessary voice over at the beginning. Nominated for Oscar Best Picture. [Reviewed 1/16/12]. 7/10. Drive Angry (2011). Nicholas Cage seems to have escaped from hell in this gory, action occult thriller which is decent, but rather two dimensional and not overly creative movie. [Reviewed 2/27/11]. 7/10. Fright Night (2011). An impressive grown up, contemporary version of the 1985 original, until it reverts the last half into the more traditional, physical action horror movie and leaves out the insidious seductiveness and lingering sympathetic layers of the vampire from the original. [Reviewed 8/21/11]. 7/10. Harry Potter and the Deathly Hallows: Part 2 (2011). This last of seven movies in the series seems to have lost the charming magic of its predecessors as the characters have grown up, perhaps too old for the magic that the earlier movies had. The special effects seem fake at times, the character evolution seems to been left behind, and the action a patch work. Except for Snape and Harry(s memory trip where he must face his most difficult choice (which even then is diluted later by give away shots), this movie is only a mere dream of the magic that it once held. [Reviewed 7/14/11]. 7/10. Haywire (2011). A late 2011 entry released in 2012 in the USA, this is a sophisticated wannabee espionage movie that has a good premise and plot that is let down by its flawed details, uneven pacing. [Reviewed 1/22/12]. 7/10. Pirates of the Caribbean: On Stranger Tides (2011). A slow paced action adventure movie seemed strained under the movie(s high expectation, but includes a generous sprinkle of humor, good action, and original fantasy discovery towards the end along with a strong emotive, relational subplot. [Reviewed 5/20/11]. 7/10. Real Steel (2011). Another family sci fi drama incorporating a robotic-human boxing theme that while it entertains doesn=t really stand out from the by the number=s generic plot and typical storyline acting. One among many feel-good movies that disappoints only in that it wasn=t even better than it could have been. [Reviewed 2/12/12]. 7/10. War Horse (2011). The epic story of a horse during WWI period with emotive scenes is stunted by an uneven tone, omitted storyline plot scenes, and less than balanced characters. Nominated for Oscar Best Picture. [1/2/12]. 7/10. Tinker, Tailor, Soldier, Spy (2011). The movie itself become a cipher, too difficult to enjoy and comprehend, unlike a number of recent non action espionage movies that captivate as well as stimulate the substantive mental game of spying, such as The Good Sherpard (2006), Spartan (2004), and Breach (2007). [Reviewed 1/7/12]. 6/10. Grave Encounters (2011). This over the top Cloverfield (2008) as a Blair Witch Project, The (1999) wannabee ends up pretty much of a mess without a real core to sustain much interest, if any. [Reviewed 2/18/12]. 4/10. Midnight in Paris (2011). The most over-rated, absurd, unbelievable, unappealing and unapproachable movie on almost all levels. Worth a record over five pages of detailed criticism and problems. [Reviewed 3/12/12]. 3/10.